Classic movies have molded me into the person I am today. I love travel and have traveled to places based on a movie’s setting or actual shooting location. My sense of fashion is greatly influenced by movies especially from the 1930s, 1960s and 1970s. As a little girl I wanted to be like Rita Hayworth because she was a flamenco dancer. I have seen many of Rita’s movies. Honestly none of them are among my favorites however it doesn’t diminish that I do enjoy her dancing, screen presence, and beauty. My favorite screen beauty was and still is Gene Tierney but Rita was in my top 10. Yet Rita was and still is more magical to me than Gene because Rita danced. She radiated great joy when she danced on screen and I see her flamenco influence even when she did modern numbers in You Were Never Lovelier and You’ll Never Get Rich. I especially see it in her posture and arm movements. One of my former flamenco instructors said she saw it in Rita’s footwork. My mother sent me to ballet class as a child. I didn’t enjoy it but now grateful as an adult. My mother and I have our differences but one thing she did do for me was search for a flamenco teacher however the teacher was in a neighboring city that was quite a drive for her. We were poor so I couldn’t go. Nowadays it’s a little more common to find a flamenco teacher in a major city but rare then. I don’t know how I found out about Rita being a flamenco dancer but I just did. It wasn’t until I was 20, when I saw her in The Loves of Carmen where she does a few numbers although not much. Until then, I hadn’t even seen footage of Rita dancing flamenco. I just knew I wanted to be like her, probably because she was so beautiful. I also grew up in a region in Florida with a strong Spanish cultural heritage so the food and music is a part of us. In High School, my classmate was a New York transplant whose aunt had nursed Rita Hayworth. I was known as the kid who loved old movies. I had a friend from Idaho who moved back to Moscow, Idaho after a year. We became pen pals for a short time. When Rita died, she mailed me a newspaper clipping of her in her famous WW2 pin-up negligee. When I left home as a teen, I searched for a flamenco dance teacher eventually finding one in Atlanta named Martha. With glee I learned Martha, as a young woman, studied with an American woman who had married into (and divorced out of) the huge Cansino family, Rita’s family. I’ve been so lucky to later meet child actress Margaret O’Brien whose own mother, Gladys Flores and aunt, Marissa Flores, were both flamenco dancers. O’Brien did meet Hayworth once at a pool party at Rita’s then-husband Orson Welles’ home during the time Orson and Margaret were making Jane Eyre. Rita knew Gladys since Gladys was a dancer with Eduardo Cansino, Rita’s father. Margaret even says her mother taught Rita dance moves. Margaret encouraged me to keep up with my dancing. I still can’t dance like Rita but I try. Below is a discreet sample of me dancing. I hadn’t danced in 3 years so very out of shape. Because of Rita, I continue my flamenco struggle but have also branched out into Middle Eastern dance and fusion flamenco/Middle Eastern. Thank you Rita! ← Does 007 eat Violet Crumble? Wonderful post. 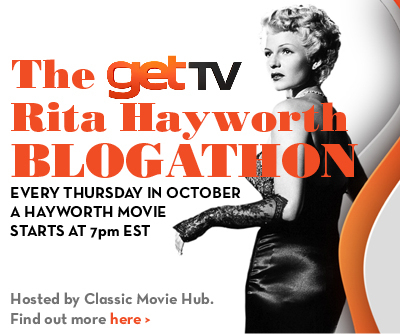 I love reading about your journey as a dancer and the influence that Hayworth offered you! I find while many people know Hayworth as an actress, many seem to forget she began as a dancer first. I’ll probably rewatch ‘You’ll Never Get Rich” sometime this week!